Other Amusements: Spring is on its way. Maybe. I'm hoping that spring is on its way. It's still really cold here but this week it's been daylight when I've got up for work. Yay for daylight. I always feel better when I get up and it's light outside; getting up in the dark feels a bit wrong, like it's the middle of the night. I've battled the cold to take a few pictures. They give me a bit of hope that it won't be winter forever. 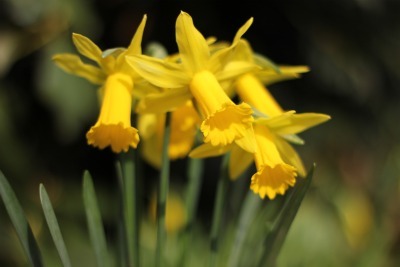 These daffodils are already in full bloom in the park! 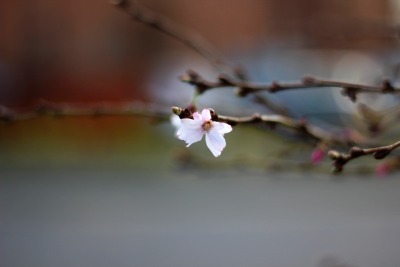 The very first blossoms are emerging on the tree at the end of our road. And right outside my house, my herbs are growing again! 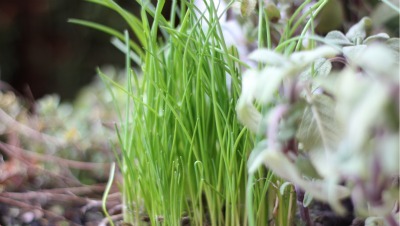 The sage lasted through the winter but those chives are totally new. Yeah, they are chives not just a clump of grass. ah, spring is still very far here in Montreal! Oh, lucky you there is snow. Here we just have sun all year, we just have two seasons- when it's so damn hot, and when rains so much and many people die because of it.Now it's raining, just a little, and the cold wheather makes me feel so good! Ahh, these pictures are lovely! The first photos of spring are always my favorites. Everything coming to life again- it's so inspiring!